Place a large pot of water over high heat to cook the pasta. When the water is boiling, salt it well and drop in the pasta. Cook to al dente, according to the package directions. Drain the pasta and reserve. While the pasta is cooking, place a medium pot over medium-low heat with two turns of the pan of EVOO, about 2 tablespoons, and the butter. Add the onion and garlic to the pan and cook the veggies until very soft, about 10 minutes. Turn the heat up to medium-high and sprinkle the flour into the pan. Cook for about 1 minute, then whisk the wine into the pan, cooking for another minute to burn off the alcohol. Whisk the milk into the pan and bring up to a bubble. Add the nutmeg, veggies and some salt and pepper to the sauce and simmer until thickened, 2-3 minutes. Add the cheeses to the sauce and stir until melted. Toss the prepared sauce with the cooked pasta and transfer to a casserole dish. Sprinkle some more of the fontina and Parmigiano Reggiano cheeses over the top and bake until the cheese has melted and the top is golden brown, about 30 minutes. In Recipes-list.com we have selected the most viewed recipes from category - uncategorized . Enjoy the best recipes specially selected for you! 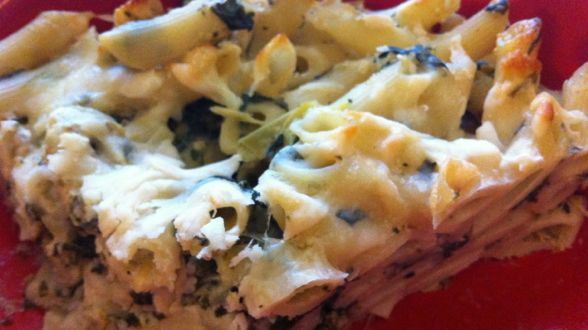 Spinach and Artichoke Mac and Cheese is the right choice that will satisfy all your claims.